Paddock info for the Laguna weekend. You can load in starting at 11:00 AM. The Formula Ford group can pit together in the area outlined in the yellow box above. Basically group together on the row behind the garages, near John Anderson Racing. It's not an exclusive thing, so if someone is there, don't worry, there will be a ton of paddock space, but it makes it easier to help out if we are all clustered in the same area. If you see someone lost or alone, invite them to paddock with you... this is key, we don't want anyone having a lonely weekend. Remember to sign the series release Saturday morning, we will help you with that. (Just four miles from Laguna Seca in the industrial park behind Starbucks off HWY 68). Super casual attire. Dress warmly. All are welcome. Plenty of parking. Review the rules, the competition section is at the end of this email. There are a ton of cars that have been worked on lovingly all winter, most of us are rusty, most of us are over-excited. So ease into this weekend, visualize giving people room, driving smoothly and adding speed progressively, and most of all, focus on a beautiful race, played out well within your limits. 3. Front row drivers will maintain a moderate "pace car" speed (1rst gear, 3500 rpm) until the green flag waves. If the front row jumps to race pace too soon, there will be wave offs. 4. No splitting backmarkers. It is nearly impossible to focus on both mirrors, especially if you are racing someone. We will talk more about this, but caring for your friends who are developing their skills or happy to race their buddies wherever they happen to be, is a core value of this program and of the Clubs we all support. Heat groups - We have completely exceeded the maximum run group size Laguna will allow at this event (44 cars) so rather than turn people away, we will run two heats... an A main and B main. The final line ups for the Saturday afternoon points race will be set by times during Saturday morning qualy. So you will be seeded into qualifying groups and then will move up or down from the A to the B group depending on your time. There will be podium Trophies, hard charger, best dice awards, Champagne spraying and more for BOTH groups... yes that means 12 bottles of champagne. This is a great opportunity to destress the first race of the year and go old school. This does, however, make the weekend a bit more complicated to manage, so please make 100% sure you come to the drivers meeting. Saturday night party 6-9 pm - The Crossflow group and its sponsors are hosting the entire event to a taco, beer and wine party. So please make sure you and your crew make it. Details below. 160 Calle Del Oaks Place, Monterey, California 93940 (Just four miles from Laguna Seca in the industrial park behind Starbucks off HWY 68). Load-in and Registration - We will be allowed into the paddock at 11:00 AM Friday March 15th. Registration on Friday March 15th, will be located at the gas pumps starting at 3:00 P.M. Registration on Saturday will be starting at 8:00 A.M. Tech will be starting on Friday at 3:30 P.M. and be open until dark. Race gas is available at the track. The 50th Anniversary event at Willow the following Friday is a 3X points event. If you run it, please let me or scorekeeper Jim Cody know. You can learn about the event here. All drivers 60 or over on the Friday of the Laguna event, are eligible for the Masters Championship. Please let Jim Cody, or myself know asap so we can score you properly. As always, any questions let us know. To register for the first race of the season, go to https://www.hmsausa.com/laguna-seca-spring-event/ . 2. You do not need to be an HMSA member to run this event. Just put a number in the membership box and the form will work fine. If you run more than one HMSA event this year, membership is a good idea. If you have any problems or issues, let me or Cris Vandagriff know. This man has the right mental preparation! We are adding a new award this year, to be given out at the Charity Challenge. The Most Improved Car trophy, will recognize the huge amount of work going into cars over this off-season. If you show up with your formerly tatty looking car looking amazing, you may walk away with a beautiful trophy. There will be several Crossflow competitors testing (weather permitting) Monday March 1 at Sonoma. Coaching and lead follow will be available if you are interested. Start you mental preparation now. Most of us will be returning to competition after a very long layoff, so remember the first-weekend mantra... "I will brake in a straighline, I will add throttle only at the apex"
Start recruiting your Modern FF driver pals to come to the May Thunderhill event May 3-5. We need at least 15 to make a run group, so let's start chatting with them now. 47 cars made it to the grid for the 5th and final race of the 2018 Crossflow Cup. By season's end, over 100 drivers had run in the series, 15 drivers made every race, and 28 drivers made 4 races. While not without heartache and challenge, it is now a group that knows each other and have reached a point where they can race close and hard, but with the respect friends afford each other. And it culminated in a season finale that saw no incidents and 99% green flag racing. To see all the weekend's action, check out and share our wrap-up film. 2018 produced great friendships, racing and worthy award winners and champions. 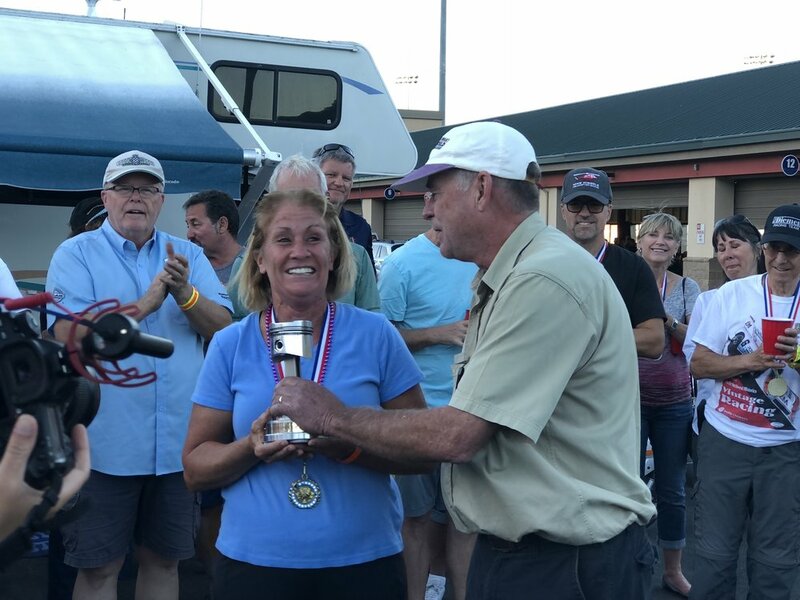 The Crossflow Cup is made each year by Jay Ivey, and goes to the driver our selection committee feels is both a great representative of the sport and a huge contributor to it. 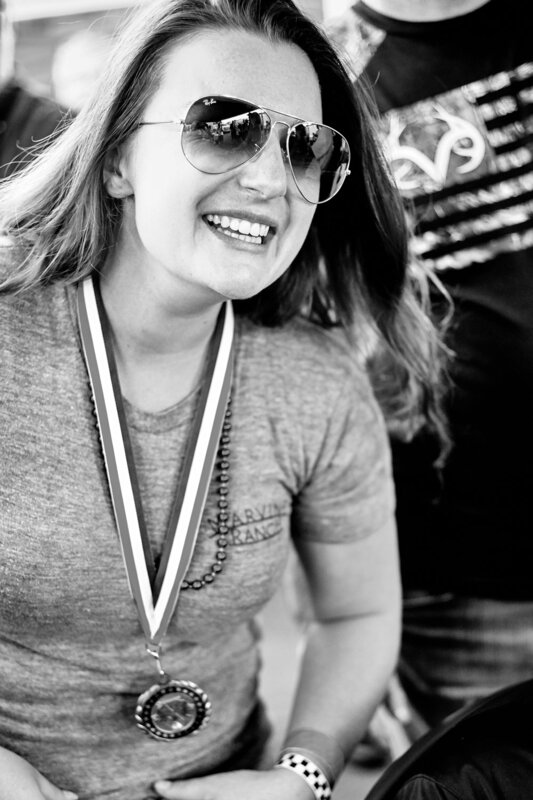 Kim Madrid is the founder for the FF Driver's Challenge and between her efforts on and off track is without question one of the great leaders and voices of the sport. The Master's Championship is for drivers 60 and over. These guys are fast, and a real inspiration to all athletes... never slow down! Dave Zurlinden was the 2018 Champion, followed by Tom Duncan and Dan Wise. Club Ford Championship Podium, Todd Strong, Dan Wise and Jeff Rothman presented by Lynn St. James. The growing Club Ford Championship was won by Todd Strong, followed by iron men (ran every event) Dan Wise and Jeff Rothman. Best Formula Ford winner, Laurent Parmantier, presented by John Anderson. Every year the car prep committee picks out a car that is exceptional. It is prepared to a high standard and has the right level of coolness to it. This year Laurent Parmantier won the best Formula Ford trophy for his immaculate Crossle 16/20. 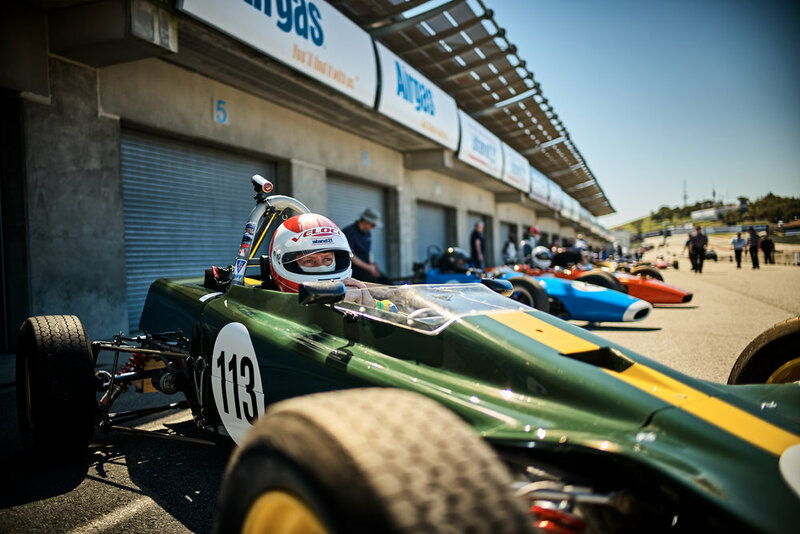 The Monterey Historics, the 50th anniversary, Formula Ford Festivals, and the Crossflow points races will make 2019 another epic year. For now, we want to say thank you to our sponsors, host clubs, Jim Cody our score keeper and everyone who came out to compete. Have a great winter, recharge your batteries and stay tuned for more news and info about next year. Welcome to the CSRG Charity Challenge and the 5th and final round of the 2018 Crossflow Cup series for Historic and Club Fords. This brings season 2 of the Crossflow Cup series to an end, with an unprecedented 50 car grid, Championship Trophies, Awards for Best formula ford (shine your car up! ), the series MVP award, and the Crossflow Cup for the person who best represented the sport in 2018. We will also be giving every entrant a commemorative gift and raffling off all sorts of cool stuff (parts, tires). For those of you new to the series, you can read all about it here (www.norwestff.com) but the main thing you need to know; this is all about friends having a great time, equal, original cars, the vintage spirit to preserve and enjoy our cars, and to keep each other safe with high standards of driving, judgment, and sportsmanship. We also want to put on a great show and have a blast. With 50 cars, everyone whether you can run in the 47's or in the 2 minutes, will get a race, just keep it a fair fight and have fun. Given this is a huge field, and the new normal in west coast Formula Ford, we are going to take special steps to avoid a lap one disaster. Those are outlined below. If you are new to historic racing, note we talk a lot more about driving standards and are tougher on errant competitors than you might be used to. We run close, hard, and with open wheels, and no roll cages, so our focus on driving has to be far greater to keep things fun and safe. 1 - Procedures and Guidelines. Welcome to large grids. 50 cars is the FIA maximum allowable at Sonoma and the largest grid of open wheel cars at Sonoma Raceway is a very long time. This could be an epic weekend, or a disastrous one depending on your commitment to responsible driving. Rules - We are under the sanctioning authority of CSRG, and running Monoposto rules. There are no Crossflow rules that conflict, only compliment. If you have any questions, review the CSRG rules and Monoposto rules before you call, or email. Also keep foremost in mind that we race primarily as members of, and at the pleasure of CSRG. Competitor Support - Michael Wirrick, and an assistant will be there all weekend if you need anything. Also, Dion Von Moltke of Racers360 driver development will be set up by the scales. He is not there to make you faster, he is there to make you more comfortable... so lean on the support. Also Michael Edick and his mobile repair shop will be available in the paddock if you need something welded or repaired. Ivey engines (Jay and Colin) will be there all weekend keeping everyone running. Schedule - The Paddock will open up at 3 on Thursday for load-in. We will have 3, 30-minute practice sessions on a very crowded track on Friday afternoon, use them to limber up, not to prove something. Qualifying will take place Saturday morning, the Crossflow Finale Saturday afternoon. Sunday morning is a warm-up session, and Sunday afternoon is the regular club feature race. We are group 6 on the schedule you have already received. Scales - The scales will be in one of the Garage Bays... The top 4 cars in each class will be weighed after the Crossflow event on Saturday afternoon, the scales will be available Friday afternoon and all day Saturday. Know your class weights (www.norwestff.com) and check your car. There is a 5 lb tolerance in place, but don't cut it close. 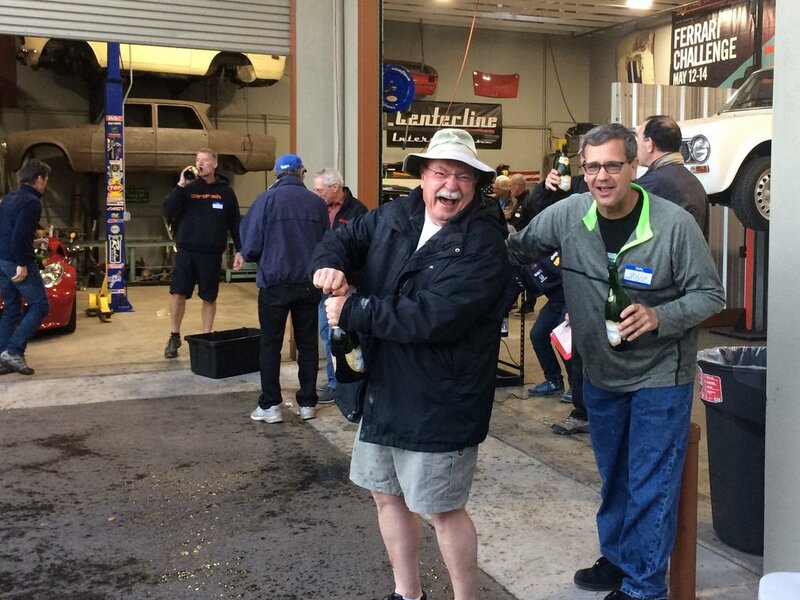 The Party - The Crossflow Podium party will take place Saturday afternoon at 5:15 sharp, in Dave Zurlinden's paddock patio, we will show you where that is at the driver's meeting. Please bring your crew, friends, and family... you must be present to win any raffles prizes. FF grid driver's meeting - There will be a group 6 drivers meeting for 15 minutes, immediately after the general drivers meeting on Saturday morning at 8:00, this is mandatory. Pack racing means if you spin, it's not 4 cars bearing down on you, but 20. If we have an accordion brake-check incident, its not one car but 30 that get spooked into locking up. It will be a bit cool, so take at least two laps in every session to warm up your tires and drive smoothly, predictably. You have 90 minutes of track time on Friday to get a sense of your car's balance. If you have doubts about the stability of your car, soften the rear sway bar, roll the brake bias forward, lower the rear, or some combination of the three until you feel confident. Qualifying grid procedure. We want the cleanest possible grid for Saturday afternoon. So if you run consistent laps faster than a 1:49, grid in the first third, laps between a 1:50-1:53, middle third, if you run 1:53 and up, last third of the grid. The first lap of Qualifying will be run under yellow, so no passing until you see the green at the start of lap two, and then ease into the session, progressively increasing your effort. Form up tight - It is critical the grid be tight and well organized before the exit of turn 9. The pace car will back us up starting at turn 8. We want to avoid cars taking the green with half the field still back in turn 9. That means fast guys lapping the back of the grid within one lap of the start. This is not safe or fun. So the minute you exit seven on the formation lap, catch up and form up. Slower guys have a tendency to let a cushion build up, don't do it. Front row, maintain a steady 2nd gear pace at 3500 rpm until the green flag. Passing. No splitting backmarkers (that means passing on both sides of a backmarker) . It's one thing to split a lone car, but there will be long rows of backmarkers, all focused on each other. So if you are ahead of a group of faster drivers, pick a side and stick to it and if you are following go down the same side. The passing car is responsible for making a safe pass, so if the driver in front of you has to get out of your way to make a pass, don't try it. Remember, the driver at the back is as entitled to a fun race, as the driver at the front. Disagreements - Throughout the weekend, someone will chop you off, will push next to you, or whatever. Talk to each other, get to know each other, sort it out and move forward as friends. If the behavior is toxic, the race stewards will get involved and that's like having your teeth drilled. So race fair and friendly. Class racing - If you are in a Historic Ford, and you are being hounded by a Club Ford, let him or her by (or the other way around). As we get bigger the classes will may end up with their own groups, but for now, respect the fact that there are two classes on track. Know the Club and Historic fords so there is no confusion. Paddock layout - The area in front of the Garages is reserved for the Formula Ford Group. Please consolidate... a 60-foot trailer and Motorhome with one car is not cool. If you have a single car open trailer, leave it up on the hill. All cars need to be facing the lane so spectators can see them. So group up, buddy up and make it look awesome. Legality - As you know we track car weight, and visually tech cars for legality. We will be testing and calibrating an engine pumping system, by pumping randomly, 10 cars. If you are is selected (I will email you in advance), please cooperate, if you have doubts about the legality of your motor, contact me asap. Jim Cody is our scorekeeper and series judge. He runs an immaculate Crossle, so please say thank you when you see him. Ivey Engines creates the Crossflow cup and is an invaluable support to us and our engine builders. The Parr Law group www.parrlawgroup.com helps with all of our legal requirements, and provide the scales this weekend. 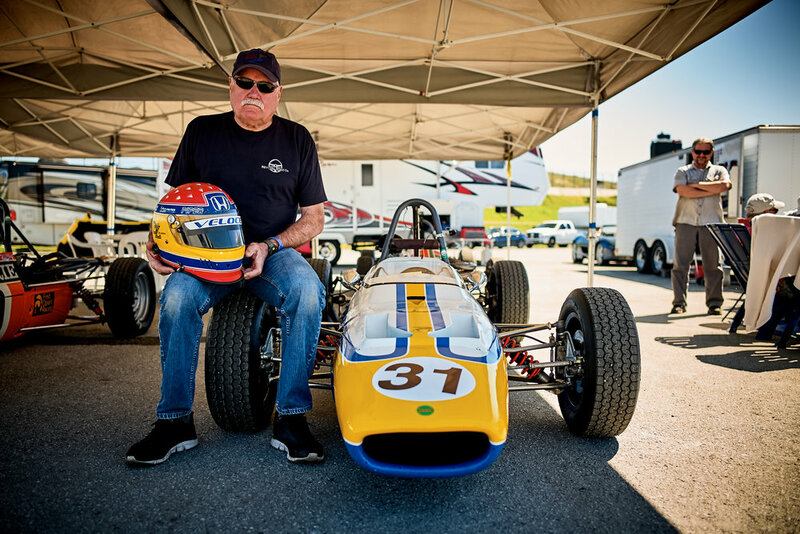 Motorsports Market http://www.motorsportsmarket.com provides series support and is a valuable resource for anyone looking to buy or sell a formula ford. How many race Passes do I get? - You get 4, and you can leave them at will call for anyone you like. What does everyone keep talking when they say, "the right mindset"? - These are old, precious cars For perspective, the newest Club Ford is 37 years old... .the average age of cars on the grid is 47 years. Every car, whether driven by an SCCA regional driver or a famous F1 Pilot has a history... a car that gets totaled is history disappearing, it's someones favorite toy gone forever. And the quality of the racing, equal, legal grids, of competent responsible drivers, produces, is unparalleled. So to make the most of this, we want to preserve our cars, while using them as God intended. This works incredibly well, if you come to play with your pals, it becomes toxic and wrong if you come to beat your pals. So come fully prepared have a great time, do your best well within your limits, and behave in a way that everyone is happy to see you afterward... that's the mindset. What if I am stressed out and uncomfortable with the group? - Hopefully, this won't happen to anyone, but if it does, you have options. You can be moved into a smaller open wheel group, or you can grid at the back for the start of the race. Both are lower stress options. You need to speak with the race director on the first, you can grid at the back on your own. You can also call it a weekend. Whatever you decide, honor your instincts. How can I avoid un-prompted spins - Spins are caused by cold tires and poor driving habits, usually combined. So take a couple of laps to get tires warmed up and ride the brakes on the form up lap for a bit of extra heat. Spins are also caused by braking too late and too hard with the steering wheel turned. They are also caused by excessive early throttle in low and medium speed corners. So brake in a straight line, and don't add throttle unless you are at or past the apex and unwinding the wheel. Historic Racing black flags, spins, and contact? - If you get a furled black flag for putting two wheels off or a spin caused by the above, that's a warning, you don't need to come in. If the flag is open (usually due to going 4 off, or a lurid spin or lockup) with your car number, come in. In historic racing, car to car contact requires an immediate stop at black flag. If there is no damage, and everyone seems chill.. they may send you back out, the may not. Significant damage due to car-to-car contact ends your weekend on the spot. If you damage your car on a solo expedition into a tire wall, but it can be repaired, your continuing to race will be at the race director's discretion and will require an inspection of your car. 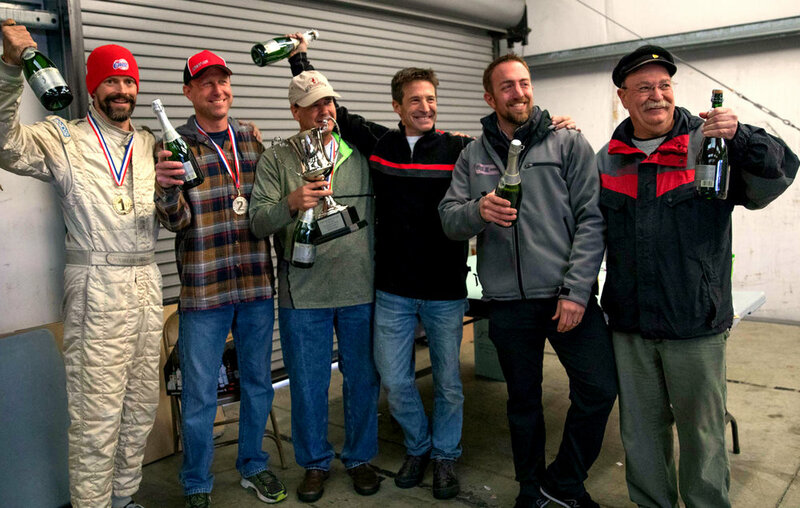 The Crossflow cup rolled into Portland for round 4, at the Columbia River Classic hosted by SOVREN. 35 drivers in 3 classes came to play for a second year, in what remains a great weekend of racing. The great food, nightlife and ambiance of a wonderful city just 10 minutes from the track, and the buzz of the All British Meet make this event special. And this year, an exceptionally deep grid of beautifully turned out cars and a uniformly sensible, competent set of sportsmen at the wheel made it a great event. As usual things got started with a test day hosted by the Lotus Club and a chance for everyone, especially the 12 CSRG drivers, to tune up for the weekend. The racing line had huge grip courtesy of the Indy cars the weekend before, so right away things felt faster than last year. The test day was uneventful other than Andrew Wait stuffing his Lola into the tire wall outside turn 12. Thanks to lots of tape and encouragement by the Anderson Racing crew, the car and its driver were back on track within a few hours. 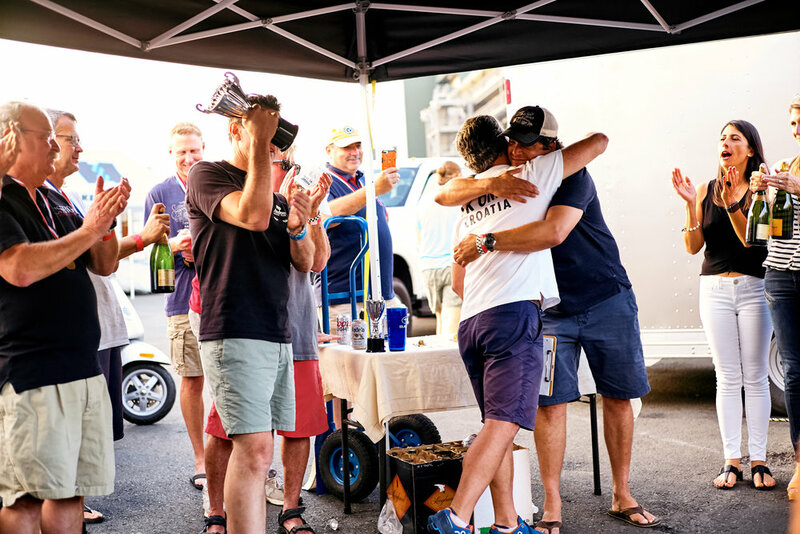 The test day was followed by the now traditional reception at Ivey engines, followed by 35 drivers, their crews and families scattering throughout Portland for more celebrating. The driver’s meeting had the usual warnings and guidance for the weekend, but also a new twist on how the race would unfold. In an attempt to take pressure off the start lap, the SOVREN stewards agreed to run a different process. The change was to run straight up the main straight, without the chicane on the pace lap and the start lap, and then to open the chicane for lap 2. Large grids including the Indycar series struggle to get through both the entry and exit of the chicane without problems (yes this is a link to the inspiration for this) when cars are streaming in and out 3 wide. At least, that was the idea. Morning practice times set a grid for a qualifying race, where again things were different in that a driver’s best time set the grid for the Crossflow points race in the afternoon, not their finishing position. As expected conference champ and run-offs bound ace Quinn Posner, modern ford drivers Neil Shelton and Scott Olson led the way, with historic points leader Art Hebert, last years third place championship driver Tom Kreger, rounding out the first few rows. A very big fast midfield came next including Ed Van Tassel in his perfectly repaired Titan, a very rapid John Greeven in his Club Ford followed by Ed Lauber, Bob Morrison and Don Stern. A very early green flag saw the field go streaming down the main straight as planned but on lap two, the short term memory most formula ford drivers suffer from kicked in and about a third of the grid bypassed the chicane the rest went through the chicane. Fortunately no one had a problem in the scary merger of chicane and non-chicane traffic, and by lap three everyone was clear on the concept and taking the chicane. Jay Ivey saving Dan Wise’s weekend. Dan Wise’s car went silent and had to be towed in, and unfortunately we had two broken cars; one got caught up with another car as it spun going into the chicane, another with failed suspension. Neither suffered serious damage and will be repaired in time for the final race. With the qualifying session concluded a few grid penalties were handed out for the chicane errors and some work had to be done to pull out the non-chicane laps to get an accurate grid. There was a moment of panic in pre-grid as the grid workers were organizing the grid based on finishing order, not best times This meant that several drivers who pulled off once they had a lap in the bank, ended up in the wrong spot. Competition director Jim Johnson spent five frantic minutes sorting it all out, and in the end, a properly gridded field streamed out on time, if with a few drivers a bit breathless. Overall pole sitter Quinn Posner and his front row partner Neil Shelton controlled the pace perfectly, and anticipating another early green, (which they got) treated the crowd to a tidy start and 35 formula fords streaming into the first turn in perfect order. Leading the historic field a very racy Chris Porritt spun on lap two and had to patiently watch a tightly packed grid go screaming by. As usual the grid broke down into distinct battles with Robert Posner, Chris Schoap, Alan McColl (in his immaculate Tiga) Tom Duncan all ran nose to tail. They were joined by a charging Chris Porritt. Another tight group that included Mike Lanning, Michael Maros, and Mark Keller kept appearing in turn 12 with a different leader. In his borrowed Van Diemen, Jeff Rogers led home a group with Steeve Hoogs, Dan Wise, Jeff Rothman, another Canadian, Keith Robinson and Steve Timpson, Trout Roberts and Mike Nau. In the end the Historic Ford Podium saw Art Hebert in P1, followed by Tom Kreger, and Andrew Wait. In Club Ford, Quinn Posner put on his usual master class for P1 followed by John Greeven and Alan McColl (with a stunning 3rd fastest lap of the race). The Modern Ford podium was topped by Neil Shelton, followed by Scott Olsen and Don Stern. There were great performances up and down the grid, with personal bests from Ed Van Tassel, and iron men (have finished 100% of the series races) Chris Schoap, Dan Wise, Ed Lauber, and Jeff Rothman. Chris is exceptional in that he also has a triple points event in his tally in addition to the series and this SOVREN club races. Charlie Lyford just needed a few more laps as he cranked out the third fastest lap of the Historic Ford grid just two laps from the end and as usual Jeff Rothman and Dan Wise crossed the line .2 seconds apart have never been more than a few feet from each other the entire race. All in it was a weekend that exemplified this series. Lots of hard racing, but with room, respect and the kind of sportsmanship that makes this as fun as anything you can do. There are a few things to think about. After watching lots of film from various cars, it is very clear too many of our cars are unstable under braking. It is never a good idea to be braking hard with any turn in the wheel, but it all becomes far, far worse if you have too much brake bias towards the rear. Pro’s can benefit on occasion form rear bias, but not us. Check your bias, it should be 60% to the front as a baseline. Your front wheels should lock up first. If your car “tanks slaps” or spins or steps out in slow corners under braking, move your bias forward, lower the rear of the car, or both. Why is this important? Its one thing to spin in front of a field of 15 cars, its another to have 40 cars bearing down on you. Rear stability in general makes a car more predictable, and in pack racing, safer. Impossible passes. We are seeing far, far less of this which is great, but it only takes one for someone to go home with their car on a wrecker or worse. If the driver in front of you needs to get out of your way for you to pass, don’t try it. Also note, that if you need an unnatural act to get by someone, you are just not fast enough to pull it off easily, don’t do it. Stay close, and wait for a chance that makes sense or just enjoy the racing. The Drivers meeting. There will always be instructions that are unique to each event. Never assume anything, so take notes, ask questions, whatever it takes to be clear on how the race will be managed. We keep saying this over and over. This is simply not possible without the help and support of sponsors, host clubs and volunteers. and John Anderson Racing for the prizes, carrying stuff around and being a credit to the sport. And not least, many, many thanks to Jim Cody, for scoring and keeping things fair. The Charity Challenge , October 5-8 at Sonoma Raceway. A our final race there will be a monster grid, participation gifts, trophies for the Historic and Club Podiums, for the Masters Championship, for the best Ford, the Series MVP and the Crossflow cup. We will be giving away lots of engine parts, a set of tires and 6 Racers360 scholarships. News and details to follow. Normally we start these updates with news of the race, and save the comments on driving, if any, to the end. For two years we have had 98% green flag racing and no damaged cars. But a reminder of the challenges we face staying safe, and the judgment required to be in this series and in our host clubs, is really the key message of the weekend. We are friends racing together, not competitors playing a zero sum game, and we need to keep that at the center of what we bring to the racetrack. On the same weekend at Thunderhill we had two cars come together, resulting in one being destroyed. The Historic Ford group in the UK, had two cars come together and the driver was rescued by bystanders from an inverted car and a fire that flared up briefly. And at Buttonwillow a car flew over a competitor and landed on another. In all cases, the drivers were uninjured. The CSRG board are finalizing their review of the Thundershill incident, and we will get a debrief from HSCC, but there are nontheless key lessons to take away after much discussion with the group. 1. If you need to leave the racing surface to make a pass, don't make the pass. Over-driving in that regard, is never acceptable. The host clubs will be far more vigilant and more furled black flags will be shown to drivers who create too much risk. 2. If you need the guy in front to move or adjust for you, don't make the pass. If you can't have at least half a car-width of leeway, don't make the pass. 3. Dangerous behaviour needs to be discussed in an open, honest way. If you scare the pants off someone, or have contact, apologize, have a chat, have a beer, but don't keep it a secret. And if you really think someone's behaviour is toxic and persistent, please elevate your concerns to the stewards as soon as you have them. We have sent people home whose behavior is not in the spirit of what we do, will continue to do so, but need data to act on. 4. Shunts are very, very rare, but do occur. If your roll bar is not at least 2-4 inches above your helmet, get it fixed or lower your seating position in the car, or both. The best approach always, is to sit on a poured seat, on the floor of the car. If you have a mounted seat, most likely it is elevating you. By being on the floor, you get better feel and better clearance. All the drivers involved in that weekend's shunts are over 6 feet tall and their cars kept them safe with the right roll bar clearance. If you need assistance with this, please contact us and we will connect you to someone that can help. 5. Use a HANS device, this is without question, something you may not live without. 6. If you don't have a clear mind, or have background issues clouding your judgment, give some thought to your approach to the weekend... maybe don't race, or talk to a friend and test your frame of mind. Friday testing showed all the newcomers, what an interesting challenge Thunderhill is. As the afternoon wore on, times came down a bit, and the fun you can have there started to happen. Lots of advice flowed, lots of lead follow sessions happened, and for the most part testing ended with everyone reasonably comfortable. Unlocking more speed in particular was Jim Cody, with the help of Tom Fallon from the Anderson Racing crew and Kurt Joerger. Jim made some changes and was quickly knocking a stunning 4-6 seconds a lap off his best previous times. Friday night the group gathered at La Cascada for a Mexican banquet and drinks that lasted far too late into the night. So Saturday morning opened qualifying under perfect, bright, sunny conditions that made all the tequila we consumed seem like a bad idea. Returning to the series a now healthy Greg Vroman, led a pack than included thunderhill rookie John Greeven, Jack Wilson, big bore driver in his second formula ford start Gary Goeringer, George Jewett, "ironman" Alan Dezanni (has run almost every available event on the west coast!) Jonathan Kitchen and Jeff Rothman, struggling to find a happy set up at Thunderhill. The midpack running in the mid 2:06 range, and separated by .8 seconds from front to back, included a far more rapid Jim Cody, Paul Kitchen, Dave Alvarado, and Norm Cowdrey, and an increasingly quicker and more comfortable Chris Schoap. Into the 2:04's was Dave Cooper, Steve Hoogs and Roger Pujol. Kurt Joerger, the master of turn 9, and a Thunderhill veteran was next separated from Ed Lauber, and a struggling Dave Zurlinden, by less than .5 sec. Dave had a new set of Avon A29's and found it challenging to switch them on and get them into their best window. The top 7 drivers, led by Ethan Shippert at a 1:59 (fastest lap of the weekend) and Todd strong in their Club Fords and then Art Hebert on the Historic pole, followed by Martin Lauber, Dan Cowdrey, and Andrew Wait. It was an unseasonably warm track, with less grip and a crosswind at the apex of turn one, that greeted the drivers as they lined up. At the green Ethan Shippert and Todd strong fell into line for a brief, but intense dice with Todd briefly passing Ethan for the Club Ford lead, before his coolant system let go and Todd had to call it a weekend with a warped head allowing Ethan to claim the Club Ford win. Behind them an epic back and forth between Martin Lauber and Art Hebert ended with Martin going wide in turn 15 and having to settle for second behind Art. Tom Duncan's motor stumbled at the start, trapping him and Andrew Wait a bit as cars passed. Both of them eventually raced back into podium contention, but Andrew's engine quit on lap 4, and he parked his car behind an equally broken Dan Cowdrey on the exit of turn 6 as Tom eventuallly finished second in Club. Chasing the third step on the historic podium Kurt Joerger edged away from Dave Zurlinden for third followed by, Ed Lauber and Jim Cody scoring his biggest points haul ever. Dan Wise narrowly beat a surging Jeff Rothman for third in Club Ford, but all massively entertained with a dice that included Paul Kitchen, Chris Schoap, and hard charger, with 11 passes John Greeven.. all running withing .4 seconds of each other. A pack that included an increasingly faster Dave Alvardo in his show-car-perfect Titan, Mitch Roth, Alan Dezzani, Jack Wilson and Gary Goeringer, circulated nose to tail having huge fun. DNF's included an overheating Mike McDermott, and Norm Cowdrey with a engine that started feeling tight. 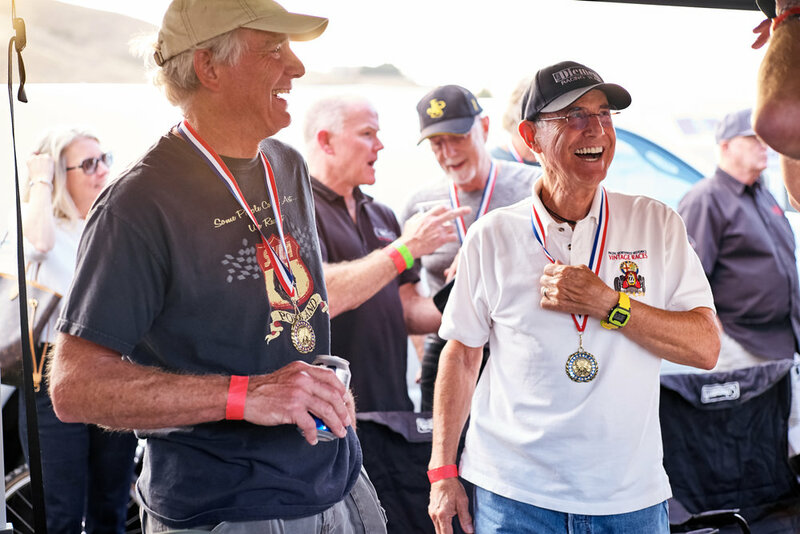 Art Hebert, Martin Lauber and Dan Cowdrey maintain the top three positions in Historic ford. But with Andrew Wait and Dan Cowdrey's DNF, Danny Baker now moves into 4th, with 2 races to go and well within reach of a podium spot if Dan C stays home for one race or suffers a DNF. In Club Ford,Todd Strong, Dan Wise and Jeff Rothman have strong positions, but are closely followed by Erik Inkrott, Kim Madrid, Alan Dezzani and Tom Duncan. 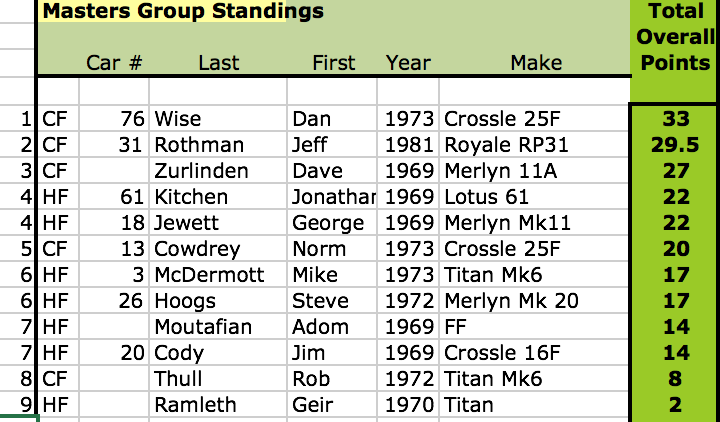 In Master's Dave Zurlinden, Dan Wise and Jeff Rothman (who celebrated his 70'th birthday at Thunderhill) lead, but are closely followed by Steve Hoogs, Tom Duncan, Jonathan Kitchen and George Jewett. We keep saying it, so support and spread the word about our sponsors! As always if you need tires, please see Roger Krause Racing and for all engine needs, many thanks to our friends and supporters at Ivey Engines. The next triple appearance points event, is the Pacific Northwest Historics, June 29-Aug 1, at Pacific Raceways in Kent Washington. If you enter this and want your 6 bonus points applied, pease email us with proof of entry and we will add that in. The next Crossflow event, is the wonderful Columbia River Classic and All British Meet at Portland, September 8-9. We will have a full test day for Formula Fords only on Friday September 7 and the Ivey Engines reception that evening. We will organize the usual convoy towing up from California for those that are interested. And the Series finale at the CSRG Charity Challenge at Sonoma will be huge fun. We are working on another grid walk, a second documentary, and the CSRG board has approved umbrella girls and boys if we want to organize that. There will also be a spouses reception at Ramsgate on Saturday afternoon as well. The variable weather and rusty driving skills, none of that got in the way of the enormous fun had by all at Laguna. We had 99% green flag racing, and while we did have one injury, overall the driving standards were exemplary. 35 cars, 10 more than last year entered making sure everyone got a race. This weekend's high levels of sportsmanship and camaraderie made this a wonderful event for all involved. The tone for the weekend was set with a wonderful party hosted by Geir Ramleth at his lovely home in Carmel. Geir really went all out with amazing food, wine and a heated chalet for the over 60 people that came. Also huge thanks to Ivey engines for sending Colin down, Roger Kraus for the prize of new Avon tires, Ed Lauber of www.vehiclesforcharity.com and Martin Lauber of19york.com for the post-race party, Jim Cody for scoring, Chris Duranowski for manning the scales, John Anderson Racing for hauling and support of said scales. Also a huge thanks to Cris Vandagriff and the HMSA crew for putting on a fantastic weekend and for the Series Podium Trophies. Cris had an enormously important announcement we will cover in the next update. And not least, the Kitchen Family vineyard provided the usual amazing wine, their 2013 Twisting Turns Cabernet. It was a challenge for everyone, for many, it was their first time at Laguna and for everyone else their first time in a race car in months. Qualifying provided just 25 minutes to get loosened up and earn the best starting spot possible. Art Hebert set an overall pole of 1:39, and behind him the usual 3-4 groups emerged with Ed Van Tasell, Tom Minnich, Mike Wirrick, Jason Cowdrey, Chris Schoap, Jim Cody, Kim Marid and Paul Kitchen all covered by less than a second and Dan Wise, Steve Hoogs, Jeff Rothman, Mith Roth, Adom Moutafian and Tom La Costa all covered by .7 sec. Ed Lauber is now pushing into the top of the grid, part of the group covered by less than .5, that included newcomer Laurent Parmentier, Dave Alvarado and Geir Ramleth in their immaculate Titan Mk 6s. 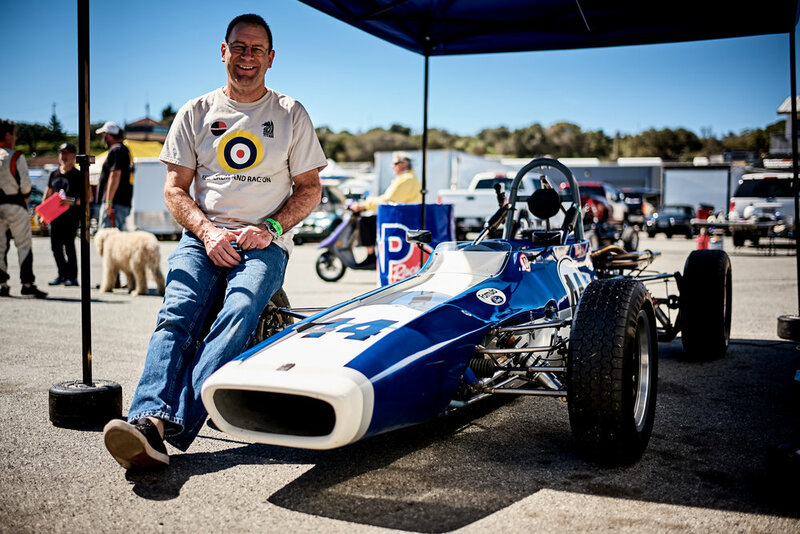 Southern California drivers Todd Gerstenberg, Todd Strong and Erik Inkrott got faster and faster as the session went on, and Laguna veteran Danny Baker, looked more and more comfortable in his new Lotus 69. By the time qualifying ended Martin Lauber had P2 overall and historic ford in hand and Todd Strong and Eric Inkrott P1 and P2 in Club Ford. Andrew Wait got P3 in historic ford as did Jeff Rothman in Club. Rain and the possibility of more, found drivers and crew looking up at the sky, and at the radar pictures on their phones trying to figure out whether to go out on a dry set up and in some cases, whether to race at all. For sure the berms and edges of the track would hold residual moisture, but how the track would be, looked like anyone's guess. As the cars lined up and filed out on their pace lap, everyone on a dry set up was celebrating; it was clear, in spite of the menacing sky, it would be a dry race. A very spread out start immediately divided the group up into about 3 distinct battles and evolved over a tense 25 minutes as the spooky damp spots on the track dried out and everyone tried to establish a rhythm. At the front Todd Strong and Dan Cowdrey ran into the distance battling with Art Hebert. Martin Lauber ran in the thick of that group until his engine went off-song with a fuel system failure, earning the first heartbreak award of the weekend. Martin kept circulating hoping his sick motor would at least leave him in a points-paying spot... sadly not to be. Further back Danny Baker, Todd Gerstenberg, Eric Inkrott and Andrew Wait traded places repeatedly with Danny eventually solidifying his P3 in Historic Ford managing a great outcome with a car that lacked top end power. Ed Lauber, Dan Wise, Laurent Parmentier Jeff Rothman, Ed Lauber, Geir Ramleth, and Ed Van Tassel (hard charger of the weekend) all ran best laps within .3 seconds of each other, eventually Geir, Laurent, and Ed Lauber broke away for a dice that would end when Geir spun to the inside of Turn 4 and injured his hand on the kickback from the steering wheel. At the finish line Jack Wilson, Jay Streets, George Jewett, Jonathan Kitchen, drag raced out of Turn 11 in a group, just behind another tight group with Jim Cody (clearly Laguna is home for Jim) Kim Madrid, Chris Schoap in a pack and the points paying spot earned by Steve Hoogs and Jason Cowdrey. The Historic Podium was Dan Cowdrey, Art Hebert, and Danny Baker, the Club Podium was Todd Strong (a sublime overall P1) Eric Inkrott and 2017 Crossflow award recipient Dan Wise in P3. There were exceptional drives all up and down the grid, with Ed Van Tassel earning a well deserved hard charger... both for speed and sportsmanship. As many passes as he made, Ed left everyone room. Laurent Parmentier completed a very cool trifecta, first race, first drive at Laguna, event in a formula ford. Jonathan Kitchen, Jay Streets and George Jewett, not only battled hard, but managed the swarm of front-runners with complete poise. In the Masters Championship standings, Dan Wise leads, followed by Jeff Rothman, Steve Hoogs, Jim Cody, Jonathan Kitchen and George Jewett. - We had a number of passes under yellow during qualifying, mostly due to a point-by. Note, if you get pointed by under yellow, you should not pass the car ahead. The corner workers and stewards cannot usually see the point-by and you will be black flagged. Black flags in our sport are bad, and multiple offenses will lead to your being barred by the host clubs. The exception to Passing under yellow is this; if the car is clearly broken, running slowly off-line. If that is the case, accept the point-by if under yellow. Drivers with broken cars, under a yellow please keep your hand in the air. Starts still ragged - We will be rolling out a new policy to try to fix this. The importance of a start where everyone is within 10 feet of the cars ahead and behind, and rolling at the same steady speed when the green flag drops, is this. When we have a tight start, as we did on the Sunday club race, 1 person gets lapped. When we have a spread out, fast rolling start as we did on Saturday, 10 drivers get lapped. Being lapped increases risk,increases stress and reduces everyone's fun...especially when being lapped means by 7-8 cars, rather than one or two. Spread out starts are caused by drivers in the middle and back allowing 3-4 car length gaps emerge, either due to caution or a setting up for a slingshot. They are also caused by pace laps that are too fast, and pace by the front row that is too high. New Start Policy - From now on, the front row will roll in first gear, 3500-4000 revs for the last half mile or so prior to the start and will not accelerate past that speed until the green flag waves. The drivers at the middle and back, must not fall behind and the host clubs will shake a furled black flag at you if you allow more than a car length to emerge within a half mile (turn 9 at sonoma, turn 13 at Thunderhill, turn 10 at Laguna) for the start line. Sonoma Raceway and CSRG host the next stop in the Series. We are expecting over 40 cars, so bring your best self to the most challenging circuit of the series. This will be another epic event and usually the loveliest weather and best racing conditions of the year. If you want to add points to your tally, the next triple appearance points race is the High Desert Challenge with VARA. Anyone that attends this race will add 6 appearance points to their tally. We want everyone out racing as much as they can and supporting their clubs! You can register for that here. Hi all... We are about 5 weeks away from from our first race. Drivers are polishing and fettling their cars, some are on diets and violent crossfit programs, others are karting and doing sim work. So to really focus everyone, here is one of two notes about the opening of the 2018 Crossflow Cup Championship. Our season opens March 10-11 with the HMSA event at Laguna Seca. To enter the event go to https://www.hmsausa.com/new-events/ and you can enter online or with a mail-in form. Imporant, you will see a Formula Ford Classification that says 1962-1972... you can ignore that, all eligible Historic and Club Fords per our series rules are eligible. Trophies - HMSA is welcoming us back and will be sponsoring Trohpies for the top 3 Historic and top 3 Club fords. So in addition to your series medals, if you podium at this race you will receive a unique trophy courtesy of Cris and the team. Friday night Party - We will have a party for the Crossflow drivers and crew on Friday night, location TBD. We are also very happy to announce that we will be adding a new championship to the Crossflow Cup. 2018 will include a Masters Trophy. The top three scoring driver in Historic and Club Ford, that are age 60 and over, will be the Masters Champions. To be eligible, drivers must enter 3 of 5 races, and be 60 or over prior to March 10. So if you qualify please email andrew.wait@gmail.com and jimcody@yahoo.com and let us know that you qualify, don't tell us your age, just that your are a Master's driver. Without sponsors, there is no series! So please support the folks who support us. For everything else, visit www.norwestff.com and stay tuned for more updates.